These moccasins, created from tanned buffalo hide sewn with sinew and decorated with glass beads and metal tinklers were worn by a Kiowa man in the early 20th century. The word moccasin, derived from the Algonquin language, actually comes from the ‘V’ shape of the instep, or the front part of the shoes where the toes would rest. Moccasins come in a variety of shapes, styles, sizes and colors depending on the culture that creates them. The Kiowa, for example, are known for their two-pieced, hard sole moccasins that were decorated with hexagonal and triangular beaded shapes. The Kiowa are also known for their sewing pattern called the “lazy stitch technique.” This technique is done by pushing the needle under the top layer of skin on a hide, but not all the way through, as with many other types of stitches. The Kiowa have a unique style that is portrayed through their material culture. The Kiowa are a Native American tribe whose roots lie in the great plains. Though the plains are known to have many grasses, the Northern plains environment still contains various flora and sharp rocks that can harm a person’s feet. Hard soled moccasins were created for protection from the environment. The Kiowa are known for their hard sole moccasins, which allowed them able to maneuver in the plains environment with ease. This was especially important during the winter months because the moccasins served as protection from the cold. Aside from being used for protection the moccasins also held a cultural value. They were worn with traditional dance regalia and used during spiritual ceremonies. The Sun Dance was among the many ceremonials where traditional dress was worn. Today, the Kiowa continue to ritualize dancing within their community. The Gourd Dance and the Black Leggings Society dances are performed every year by members of the tribe. Watch the video below to see a Kiowa War Dance song. Moccasins like these are known as a hard-soled type. These particular moccasins are made from two different pieces of hide. The rawhide sole is stitched to the soft, tanned hide body with sinew. Hard-soled moccasins were common among many Plains Indian tribes in the early 20th century. These tribes were known as bison hunters, who followed the bison herds across the North American continent. Since the Plains Indians from this period were a mobile group of people they needed footwear that could withstand rough or rocky terrain. The type of beadwork on these moccasins became widespread after European contact. The European soldiers brought with them glass bead and would trade with Native communities. The introduction of glass beads to Plains Indian tribes sparked a revolution in the decorative treatment of garments. Before the availability of glass beads, Plains women would decorate their clothes with paint, shells, and flattened quills. It was a lot of work to make beads out of shell or to flatten porcupine quills. With the introduction of glass beads, Plains women could make more extensive designs. The small glass beads are available in a variety of colors. Plains Indian beading is a fashion trend that is still alive and prospering today. Both men and women participate in the craft. Moccasins along with other beaded works of art continue to be made by Native artists throughout North America. Check out this video about Greg Bellanger a contemporary Ojibwe beadworker from Minnesota. 2011 Hunting. 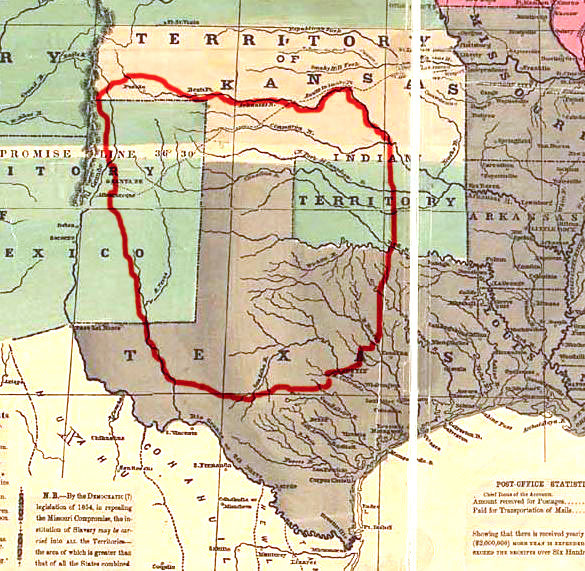 in Encyclopedia of the Great Plains. eds. David J. Wishart. These Crow moccasin boots (each 12” H x 9.75” L x 3.25” W) are made of tanned bison skin and have a dark brown rawhide sole that is attached without a welt (a long, thin piece of leather that is normally included in moccasins to reinforce the seams). The top of the foot section on each boot is decorated with brightly colored beadwork in the form of an orange flower while similar orange and light blue beaded flowers appear on the upper portion of the boots. There are leather “laces” on each boot at the top of the foot and then around the upper section of the boot near the shin. 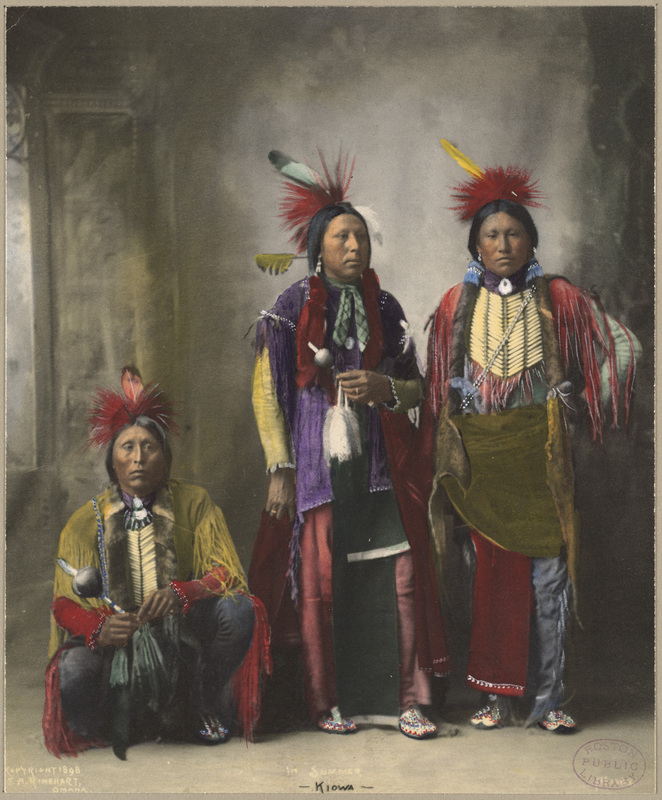 The Crow are a wide-spread people who originally lived on the Great Plains in what is now Montana and Wyoming. Most Crow today still live in Montana. Native-made moccasins and boots vary dramatically from tribe to tribe in their style, decoration, materials, and methods of manufacture. These moccasin boots were likely made for a Crow woman to be worn along with a traditional buckskin dance dress outfit. This type of outfit consists of a partially beaded skirt, a top with little to no beading, high-top moccasin boots, a beaded purse, a dance shawl, and a feather dance fan. The dancers also often wear chokers, beaded hair ties, fur hair extensions, and other accessories. Moccasin boots such as these can take a long time to make depending on the moccasin pattern and how complicated the designs are. Moccasins are always made of tanned leather and then decorated in a variety of ways. Each tribe has their own unique style of decoration, and you can often determine a person’s tribal affinity based solely on these designs. Any beadwork and other additional decoration are always sewn onto the leather with sinew before the moccasin is sewn together. All moccasins are actually sewn together inside out and then carefully turned right side out in order to add the finishing touches. Numerous cultures around the world have used horseshoes to prevent their horse’s hooves from splitting. There is debate, however, as to whether or not the Romans used nailed horseshoes or other hoof coverings. A few scholars have argued that several horseshoes can be dated to the Iron Age Roman world. One such horseshoe was found in England at the Sheepen Farm site of Camulodunum. The latest date for this horseshoe could be A.D. 60, though it was likely used much earlier. The Sheepen horseshoe is almost exactly the same shape, size, and weight as the horseshoe at the Sam Noble Museum. One of the only differences is that the shoe from England has a caulkin, a bent piece of metal at the end of the horseshoe. Caulkin were used to give the horse traction on slippery terrain. To create a horseshoe during the Iron Age, a standard sized bar of iron was used that measures from .5 to .75 of an inch wide (1.3 to 1.9 cm) and .25 of an inch (.6 cm) thick. The Sam Noble horseshoe is .25 of an inch (.6 cm) thick, fitting the description perfectly. The bar of the shoe is bent around until the two sides are parallel, making the characteristic horseshoe shape. The Iron Age horseshoe also has caulkin, although there is no set type of caulkin shape in these shoes. Each side of the horseshoe has three nail holes, which can also be seen on the Sam Noble example. The type of nail found in Iron Age horseshoes, and which are seen in the Sam Noble horseshoe, are fiddle-key nails. Fiddle-key nails have oval heads flattened on each side and a shank that joins with the long side of the oval head. The shank ranges from 1 in to 1.5 inches (2.54 to 3.8 cm) long. The area closest to the sharp point is flattened. The oval head of the nail is so large that it cannot rest flat against the horseshoe and so projects beyond the surface of the shoe. The nail projection gave the horse better traction. The nails stuck out farther than the caulkin, indicating the caulkin may not have been in contact with the ground unless the terrain was extremely uneven or soft. The Sam Noble horseshoe does not have caulkin, so the nails were the only device for traction. Iron Age horseshoes have been found from Britain to France, Germany, and Switzerland. Roman military horses were likely fitted with horseshoes by soldiers recruited for work in the Roman cavalry. These men, who had used horseshoes at home, likely continued using their horseshoes in the Roman military. The Roman auxiliary army used war horses in their cavalry. Since the Sam Noble horseshoe was in the same collection with the auxiliary’s spearheads, it is possible this horseshoe was used by the Roman cavalry. Many Germans were in the cavalry since they were thought to be excellent riders. The forts along the limes Germanicus needed an area to house their war horses and equipment. In addition to war horses, every garrison, cavalry and infantry, had hundreds of pack animals such as mules and oxen to transport their goods. So the cavalry also needed a way to outfit the hundreds of horses and other pack animals needed for war and transport. 1983 Roman Forts of the 1st and 2nd centuries AD in Britain and the German Provinces. New York: St. Martin’s Press. 2000 Roman Weapons, Tools, Bronze Equipment and Brooches from Neuss – Novaesium Excavations 1955-1972. BAR International Series 862. 2011 (1941) The Iron Age Horseshoe and its Derivatives. Read Books. Snowshoes have been used by humans around the world for thousands of years. Some of the oldest known snowshoes have been found in Central Asia and date back to approximately 4000-3000 BCE. There are many different types and shapes of snowshoes but all are designed for the same purpose. Historically, in North America there were five basic shapes, or types, of snowshoes: the spear (or lance), the leaf, the disc (or pear), the ellipse, and ovate. Each shape was influenced by local terrain and snowfall amounts. A snowshoe used in areas of light snow and dense forest was less desirable in open terrain with deep drifting snow. Likewise certain shapes were preferred for long distance travel. All snowshoes, regardless of type or origin, are meant to help a person walk on top of deep snow without having ones feet sink below the surface. This makes walking easier and helps to minimize the amount of snow that accumulates on ones feet and legs, keeping the wearer drier. Snowshoes work by spreading out the weight of your foot over a larger area, in the opposite way a pair of high heels concentrate ones weight on a small point. By spreading the weight of the wearer out over a larger area, the snow’s surface can then support the weight of the wearer without collapsing. The density of the snow and the weight of the wear affect how large the snowshoes need to be in order to effectively distribute the weight. Traditionally snowshoes, like the model shoes shown above, were made of a lightweight wooden frame that was laced together or covered with animal skins. Today snowshoes are still popular and have evolved into high tech outdoor equipment, utilizing the latest materials and technology. The following video shows George Albert of Ruby, Alaska making and talking about traditional Alaskan snowshoes. Haudenosaunee, or Iroquois Confederacy. The Haudenosaunee is a group of six associated tribal groups, the Kanien’kehake (Mohawk), Onayotekaono (Oneida), Gana’dagwëni:io’geh (Onondaga), Guyohkohnyo (Cayuga), Onöndowága’ (Seneca), and Ska-ru-ren (Tuscarora) Nations. The confederacy is believed to have been founded by a prophet known as the Peacemaker with the help of Aionwatha , sometimes referred to as Hiawatha. The exact date of the foundation of the confederacy is unknown but is thought to be one of the first of its kind in North America. The following video includes a portion of the Peacemaker story as told by Jake Swamp, a Mohawk chief and spiritual leader.